Just before I gave birth, Adrien and I had the most spectacular meal at this gorgeous new restaurant in Old Montreal, called Le Serpent. 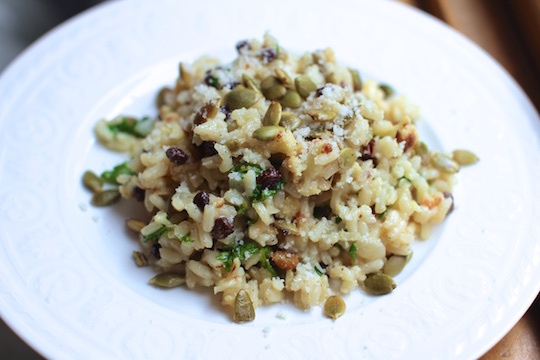 I usually make it a point to never order risotto or pasta in restaurants (too easy to make at home)... but to ease my pregnancy-induced carb cravings I ordered the roasted cauliflower risotto, which as per the menu was made with raisins, toasted pumpkin seeds and truffle oil. What a strange combination, I thought, but hey, why not? And then this luxurious plate of exquisitely creamy al-dente risotto arrived in front of me... with its subtle hints of truffle, combined with the sweetness of the raisins, the saltiness of the parmesan, and the crunchiness of the toasted pumpkin seeds... well it made for absolute risotto perfection! 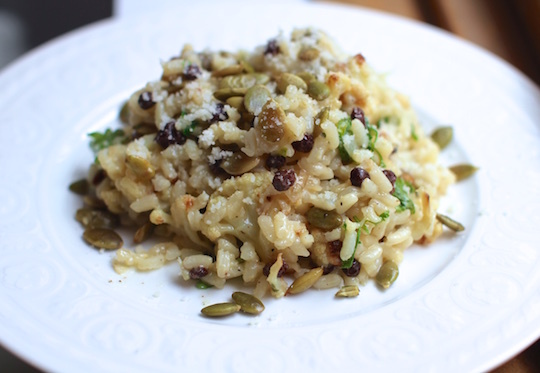 I usually find risotto kind of boring, but this one is just overflowing with flavour, and boring it is not! And as I savoured every last bite of my meal, I made a million mental tasting notes, knowing full well that I would be attempting to recreate it at home. And after some experimentation, I think I got it! And you guys, it's freaking delicious! And rather easy to do too. First roast the cauliflower: Preheat oven to 400 degrees F. Toss the cauliflower florets with olive oil (1-2 Tbsp) until well-coated. Spread out evenly on a baking sheet and sprinkle with salt & pepper. Roast in oven for approximately 20 minutes (stirring once halfway) , until edges are nicely browned. Set aside. Toast the pepitas: (I did this simultaneously in my toaster oven as the cauliflower cooked). Preheat oven to 325 degrees F. Toss pepitas in 1 tsp olive oil and spread out evenly on a baking sheet. Roast for 13-15 minutes until slightly browned. Then sprinkle with salt & pepper and set aside to cool. 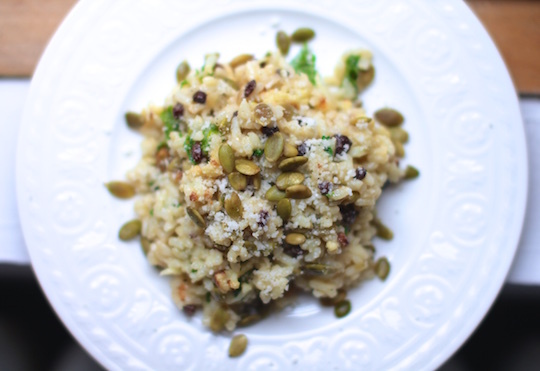 Make the risotto while the cauliflower & seeds are roasting. In a medium-large sized pot, melt the butter over medium-high heat. Add the minced onion and cook for about 5 minutes. Add the wine and turn the heat down to a gentle simmer. Stir frequently until the liquid is all absorbed (approx 3 minutes). Add 1/2 cup stock, and again stir frequently (but not constantly) until all the liquid is absorbed. Then repeat with remaining stock, 1/2 cup at a time. Do this until the rice is cooked al-dente (soft on the outside but still slightly firm in the centre), about 20-25 minutes. Remove from heat. Stir in the truffle oil, parmesan, currants, & cauliflower. Adjust the seasoning as desired.